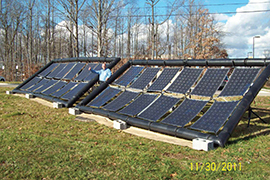 In 2011, six years after starting Wakonda Technologies Inc., Fritzemeier tests a solar array for the U.S. Army at Aberdeen Proving Ground in Maryland. Shown in the photo at right, the system set records for speed of deployment – under 15 minutes – and solar power generation per kilogram. In spite of his background working on NASA’s space shuttle, Les Fritzemeier, MBA ’01, is not, as he puts it, “the technical guy” for any of his startup businesses. When he spoke with us in April from his home near Boston, he was an employee or a co-founder in five new companies, only one of which had any sort of public profile. Fritzemeier used to be the technical guy all day long, before he turned entrepreneur. Upon earning his engineering and materials science doctorate from Columbia University in 1984, he went straight to Rockwell International in Canoga Park, California, where he considered the pros and cons of various advanced metals and composites for use in the shuttle’s turbine engines. Whenever he wanted to do something innovative on the shuttle, he discovered, he needed skills beyond an engineer’s. He had to understand how to create and staff a project, and, crucially, how to sell the whole thing to management. That work led him to question how companies make decisions, so Fritzemeier, whose bachelor’s degree came from another Lutheran university in South Dakota, eventually enrolled in Cal Lutheran’s MBA program to find out. “I’m not sure I ever really got that answer, to be honest – every company is so different,” he said. “But it’s been tremendous.” He completed his studies by correspondence after a move to the East Coast, taking three of his MBA courses mostly over the telephone. When Fritzemeier later assisted with the launches of four or five enterprises using micro-electromechanical systems (MEMS) that were born in university laboratories, he became an expert in raising funds and building teams. “That’s really where I got the bug to start my own company,” he said. Now, owing to speedy growth in the renewable energy sector and his own strengths, Fritzemeier is placing his bets on companies that are pushing advances in solar and wind power. Collaborating with different technical people in each case, he runs the business side of efforts to 1) revamp the manufacture of solar modules to bring down costs, 2) build a new kind of wind turbine for locations near cities and 3) harvest the sun’s energy more efficiently using polarizing film instead of silicon. For the wind project, he also supplied some know-how and his garage, where the company built its first prototype. He will need help from mechanical engineers to make a turbine prototype worthy of testing in a wind tunnel. So while he’s not the technical guy, as an entrepreneur, Fritzemeier remains attracted to startups that are defined by their approaches to technical challenges. By far, the most speculative project he’s involved with is the attempt to replace silicon, a semiconductor, with cheap, lightweight plastic film that has a theoretical potential to harness far more of the solar energy hitting rooftops. As he balances risk and reward, Fritzemeier is prepared for surprises along the way.